Meet Ability Fair Master of Ceremonies, Michael Braxton, Jr.
Mike Braxton, Jr. grew up in Atlantic City and Galloway for the most part, and graduated from Oakcrest High School. “You can just say I grew up in Atlantic County,” said Mike. He was an avid athlete in high school, playing everything from freshman basketball to varsity football, and track and field, where he did just about everything – the 100, 200, 110 high hurdles, long jump, triple jump, 4 x 100, 4 x 200, sprint medley and even the occasional and grueling 4 x 400. After a semester in college, and at a crossroads, he took the Civil Service exam and his high score led him to a position in the Atlantic City Police Department. Fast forward to June 9, 2013, when a motorcycle ride ended in a terrible accident that cost Mike his leg. That year he spent Father’s Day at Bacharach, seeing both his children “but stuck in the bed, that was horrible,” said Mike. Afterward, rehabbing to return to work, the former Atlantic City public safety director Willie Glass told his niece Lauren McVey -Harsch about Mike. Lauren’s husband was a well-known prosthetist affiliated with the Challenged Athletes Foundation. They explained to Mike that as a first responder, under a program called Operation Rebound, he fit the criteria for a grant for a prosthetic. Mike found himself headed for San Diego to see the Challenged Athletes Foundation Triathlon. 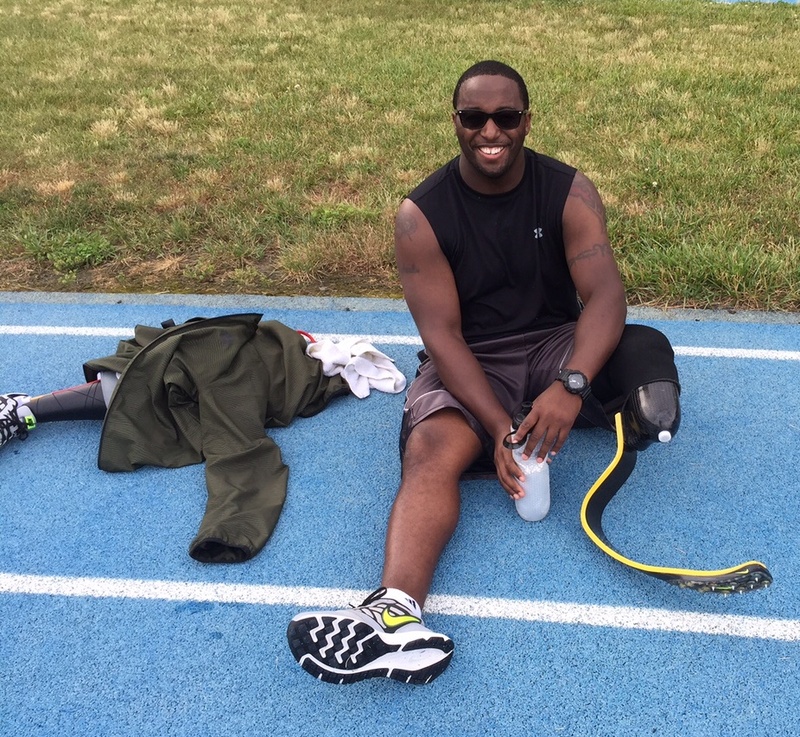 Mike returned to work a year after his accident as a detective in criminal investigations. Later he transferred to community relations, becoming an instructor with the LEAD program (Law Enforcement Against Drugs) and getting out and interacting with the people of Atlantic City. Coffee with a Cop. Police Athletic League. Helping kids do their homework. And then training after his shift.